From the millions marching across America to Jacinda Ardern announcing she is to become one of the first world leaders to become a mum while prime minister, there have been encouraging signs that we may be moving some way towards redressing gender inequality. In Australia, some of the most powerful statements have been made by the world of sport – not least in the successful launch of the AFL Women's competition. In the local beer world, there have been no greater advocates for women than the trailblazers at Two Birds Brewing. And, as of last night, those two worlds have come together as one with the launch of a new collaboration between the Western Bulldogs women's footy team and the Spotswood based brewers. Trail Blazer is a new lager decked out in the club's red, white and blue colours that will be available at AFLW and VFL games played at VU Whitten Oval throughout the 2018 season and more widely across Australia from April. It's the latest in a rising tide of collaborations between independent breweries and Australian sports clubs. 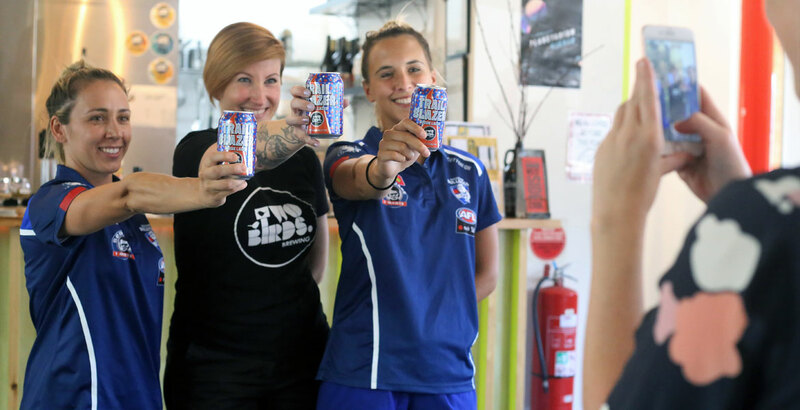 Two Birds co-owner and brewer Jayne Lewis (pictured above with players Angelica Gogos and Bailey Hunt), who is a keen supporter of the Western Bulldogs, said: “I was lucky enough to watch the men win the Grand Final in 2016, so to work so closely with the women’s team on Trail Blazer is awesome. “We take pride in being not only Australia’s first female-owned brewery, but also in being the first brewery in Melbourne’s Western Suburbs, and we love what the west has to offer. As with all Two Birds packaged beers released since their rebrand last year, the cans are designed to tell a story. In this case, they chose illustrations of a cup "to celebrate winning and backing yourself", the sun setting on a new trail being blazed, and the brewery's signature birds "to highlight the importance of teamwork". The new Trail Blazer lager, a collaboration between Two Birds Brewing and the Western Bulldogs. According to Jayne, the new partners-in-beer have had a relationship since the brewery first opened in Spotswood four years ago, although the idea to create a beer together was only raised late last year. "It all came together in a matter of weeks," she said. "It was a classic case of all the stars aligning! "We had been speaking to the Bulldogs about supplying beer for the AFLW games at VU Whitten Oval and it became apparent that they needed all beer to be in a can. We put forward the idea of creating a beer specifically for the team and the occasion of enjoying a game of football. "We worked together on the style of beer that the fans attending would enjoy and [agreed] we would use Australian malt and hops and then we fleshed out the recipe. The name was a team effort and the Bulldogs were happy for us to take the lead with the design side of the project. "There’s been so much buy-in from the club throughout the whole process and they’re genuinely excited about the beer!" Western Bulldogs CEO Ameet Bains said partnering with Two Birds was a natural fit, adding that he is proud to be working with a fellow western suburbs business. “Two Birds and the Western Bulldogs share many of the same values and characteristics, and it’s fantastic we are able to formalise an official partnership for 2018,” he said. “Jayne and Danielle have been able to build Two Birds Brewing into a highly successful business in the heart of the western suburbs, and we’re proud to be given the opportunity to collaborate on the new Trail Blazer lager. Perth's new Optus Stadium apart, the country's major sporting citadels and the leagues that fill them remain locked into contracts with the two multinational brewing companies that dominate the beer landscape in Australia. Yet, with this venture coming on the back of other partnerships between small breweries and the likes of Essendon FC, Central Coast Mariners and Melbourne City FC – and with clubs and leagues looking for ways to improve the fan experience, it seems likely that momentum will continue to build. "It's a hot question," says Jayne when asked just how far such momentum might carry small brewers in the sporting world. "Hopefully stadiums can find a place for multiple suppliers in the future, as is the case in other markets like the US. Wouldn't it be nice to see in our lifetime! "It's not something we've thought about tackling ourselves but maybe we'll put it in the five year plan." As for the present, Jayne's Two Birds co-owner Danielle Allen says building a relationship with the Western Bulldogs and seeing it take flight has been a special milestone for the whole team. “It’s particularly special as the partnership is working with the women’s side and, as Australia’s first female owned brewery, we are immensely supportive of women following their dreams, no matter what history has preceded,” she said. Trail Blazer will be available at AFLW and VFL games played at VU Whitten Oval throughout the 2018 season and more widely across Australia from April. 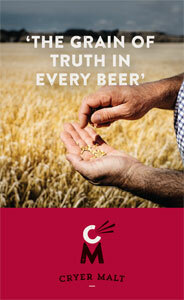 If popular, it may become part of the brewery's ongoing range. Look out for another story on a new partnership forged by an independent Australian brewery in another sport on The Crafty Pint next week too.